Gray’s philosophy could be described as Common Sense (albeit of a far more skeptical nature than Thomas Reid’s), and while his work is informed by various Buddhist traditions, he never wholly embraces the supernatural truths of religious dogma. The poetry is grounded in the material, as Gray continually reminds us that: ‘Things as they are are what is mystical’, from ‘A testimony’. He is always a traveler but never a tourist, at home in the decaying world of things; his voice tinged by an unshakeable melancholy not dissimilar to the Romantics. Does, waiting with a punch. Here the rhyme carries an ironic stamp of realisation and the closed cadence is wholly fitting. Gray’s voice is unmistakable and, in poem after poem, he amplifies the world in which we live: ‘we are given the surface again, but renewed with awe’ from ‘A testimony’. While less pronounced in later collections, Gray’s preference for simile over metaphor is indicative of his contract of honesty with his readers and compliments the organic nature of his work. Readers get the sense that he has lived these things. His conclusions feel instinctively right and, in this way, his work compares favourably to a nature poet like the Pulitzer-winning Mary Oliver, who strays too easily into the prophetic. he will never have his hand upon a firm breast again. and having lost his house he won’t build again. While there may be good reason to revisit these lines (aside from the blush this Larkinesque honesty might cause in a few readers), the new less-specific ending feels grafted on and at odds with the immediacy of the rest of the poem: the author is imagining what the man is thinking and making this thought a metaphor. This is not the only place in the book where a sensory image has been sacrificed for an abstract metaphor or allusion. now show me the dungeon. While these omissions underline Gray’s quality, I am left wondering why so many great poems were culled when lesser poems remain. 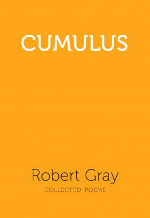 Whatever the author’s wishes, Cumulus should not be seen as definitive. While the book is a fair introduction to Gray’s work, I’d recommend readers return to the original collections and the various New and Selecteds for the full glory of Gray’s achievement. This entry was posted in BOOK REVIEWS and tagged Aidan Coleman, Robert Gray. Bookmark the permalink.